As we arrived in Kalaw we inspected The Pinehill hotel that we are using in our standard hotel category. 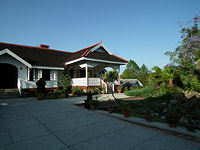 This hotel accommodation of bungalows is set around an original colonial bungalow. The large hotel garden & green lawn reminded us of an English garden. We checked in at the Amara Mountain Resort in the late afternoon. 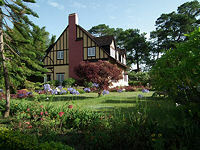 This is an old English Mock Tudor style house set in a beautiful garden of flowers, plants & trees. The reception area is like a drawing room with sofas circling the central fireplace in the original house. There are 2 rooms on the ground floor behind the dark teak wood doors. There are more rooms upstairs from the imposing dark wood staircase. We stayed at the new wing that has been built in the same style, with a drawing room with fireplace downstairs, and bedrooms above. Our windows looked out onto the impeccable gardens. In the old wing some rooms have beautiful four-poster beds. All rooms have fireplaces for cooler winter months. The dinner at this resort is all English & Western dishes like French Onion Soup reflecting the English & Western tradition, although local dishes are also available. We felt we had a peaceful & quiet night in the country. Next morning we drove to Kakku. 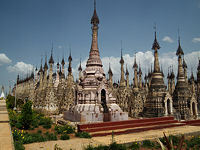 The trip to Kakku is to see the famous two thousand stupas ancient pagoda. The visit to this temple has to be guided by the local Pa-O people & not outside tour guide. We left our guide behind in Taunggyi town & joined a young local girl in her Pa-O traditional costume for the about an hour's drive to the location. The journey to the temple had an additional excitement for us that day. It was a 3 day celebration for young children preparing to join the monastery for their future. 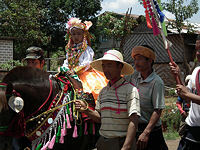 Our car was held up behind a large procession of people joing the children in colourful local costume on horseback for the celebration. The crowd were singing & dancing too - it was a very happy event & atmosphere. Although we were held up for about half hour for the parade to walk from the village to the monastery it was worthwhile as an additional insight into the local culture. The date was the 3rd May. I am not sure if this is carried out on the same date every year. We arrived in time for lunch at the local restaurant right across the other side of the road from the imposing temple complex. The restaurant was a large & unattractive place. The lunch was unmemorable too. We entered the temple, again taking off our shoes & socks. My bare feet are by now getting used to walking on hot ground after the first experience at Mrauk U. The sight of many stupas lined up together in rows as well as on different levels & different colours too is magnificent. The sound of the bells ringing in the breeze was calming as well as quite spiritual. There are some beautiful & still well-preserved original carved reliefs on some stupas. Every corner we turned we saw a different group of stupas. They are gold, white, grey marble or red brick or dusty pink. It was an hour of sheer wonder but the car journey to from Kakku is long & tiring. We left Kakku & on our way to Inle Lake. We had another hour drive to reach the jetty in the town of Nyaungshwe at the northern end of Inle Lake and boarded a long & narrow wooden boat with 3 chairs, each with life jacket provided which was waiting for us. Within minutes we were on the river down towards the main body of the lake. The vast horizon of the lake was soon opening out in front of us. We rode through floating gardens & by passed many local boats, fishing or clearing the overgrown grass & plants beneath the water. The lake is not very deep but is very wide. There were many white egrets flying around for their fish. Our boat caught up with one bird which flew above our boat for a long time. This reminded us of the recent BBC series 'Earthflight'. Halfway down the lake our boatman was looking for the entrance to the channel to uur hotel, The Villa Inle Lake Resort & Spa. He missed it & our guide had to navigate him through the vast areas of floating plants & greenery cutting through the weed-choked canal up to the hotel. We rode past several stilt huts over the grassland & water on both sides & also passed local boats & workman working in the area. The huts are for the farm workers to stay while during the season. All around the lake are floating gardens growing tomatoes and other vegetables. The lake front villas of the hotel finally came into view among the trees & plants in a natural environment. Our boat came to the end of the waterway at a wooden landing stage leading up to the hotel. The land on both sides of the canal was set out as rice fields. 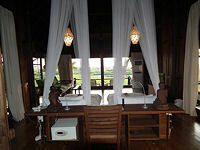 I was very pleased to see that the buildings of Villa Inle Resort & Spa has blended in very well with the environment. Our lake front villa was sensational. The room is large & beautifully designed with a dark wooden floor, some parts of the wall, ceiling & furniture. The bath room is in a separate section of the room behind a sliding door. The bathroom is almost as big as the bedroom with a large bath tub in the centre and a separate shower room & toilet opposite. The most stunning feature in the room is the enormous windows around the front part of the room allowing views of the hotel gardens & and of course the rice fields and lake beyond. There is a wooden deck outside the room with table & chairs to enjoy this natural environment. Next morning we began our day by visiting The Phaung Daw Oo Pagoda. The ride across the lake was again extremely enjoyable, watching the local daily life unfolding. 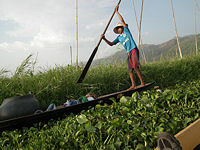 We saw local boat doing the fishing, clearing the overgrown greenery on the lake or delivering their daily goods to markets or their own villages etc. We also rode through different local floating villages. We saw young boys about 10 or younger already proficient at rowing their boats in the unique local style, their leg wrapped around the oar. It is a wonderful sight to watch. The beautiful sight of the massive red roof of the temple with a golden stupa on the top came into view on the bank of the lake. This temple is full of the colour of gold especially the five famous ancient Buddha statues.These images have had so much gold leaf applied over the years that they are almost ball-shaped. Afterwards we rode through canals choked with weed & foliage up to Inthein to visit the ancient Schwe Inn Thein Paya. The journey through the canals is intriguing. We saw young children bathing & water buffalos cooling in the water. We arrived at a lovely & unspoilt landscape of green trees & bamboo huts of the village of Inthein. The local people are bathing & washing in the water. After we got off the boat the landscape became rows of souvenir stands & shops along the way to the market & temple. The local market is closing around mid-day at around our arrival time but there were more souvenir shops along the stepped pathway to the temple. The first group of ruined stupas is immediately behind the village. These crumbling stupas are part covered by jungle but some beautiful carvings of Buddha & animal figures still can be seen. 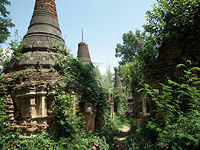 The many different stupas are emerging among the trees & jungle looking abandoned. There are hundreds of stupas with gold colour or in red brick, some old and fallihjg into. There is a large gold Buddha image inside the main temple and from the pagoda there is great view of the surrounding area. Our guide took us back by a different route through bamboo forest & riverside paths This was delightful to see the local children swimming and the women washing clothing by the river.